These adorable puppies belong to Juan and Vanessa of Las Vegas. 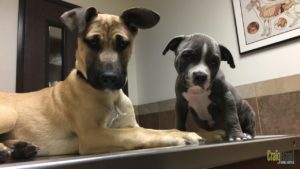 DAK (pictured on the left) is a 5-month-old a Pitbull-Shepherd mix.He is full of energy and despite his size, he absolutely loves to play. DAK is a very active puppy and loves to go for runs. 3-month-old BLUE (pictured on the right) is a blue nose, Pitbull. BLUE is the newest edition to the family. He loves to play as well and to eat as much as he can. We couldn’t choose between the two, so congratulations DAK & BLUE, you boys tied for our May our 2017 Pet of the Month!